Optical Coherence Tomography (OCT) is a technique that uses light to create a two dimensional cross-section image of the eye. This technique allows for imaging of either the anterior segment or the posterior segment of the eye. Decision making for refractive surgery is aided by evaluations in either the pre-operative or post-operative stages. The main focus of this section is to discuss the Visante Anterior Segment OCT, its properties, capabilities and functions in evaluation of patients being considered for phakic intraocular lens implantation or excimer laser eye surgery in Modesto / Stockton. The newest software version 3.0 of the Visante has created a data link with the ATLAS Corneal Topographer. The capacity to combine the anterior surface data from the ATLAS with the pachymetric mapping of the Visante creates the capacity to calculate the posterior surface data. This posterior surface data plays an increasingly important role in consideration of excimer laser refractive surgery. Optical Coherence Tomography (OCT) is a non-contact, real-time technique that uses low energy infrared laser energy to image structures. The more commonly used retinal OCT uses 820-840 nm light which allows for excellent tissue penetration to the level of the retina. The Visante Anterior Segment OCT (Carl Zeiss Meditec, Dublin, California, USA) utilizes 1310 nm light which has greater absorption resulting in limited penetration. This allows for increased intensity of the light as decreased amounts reach the retina. As such, in the Visante, the light is 20 times more intense, giving a much greater signal to noise ratio. This increased intensity allows for increasing the speed in imaging twenty times, yet retaining similar signal to noise ratio levels as the retinal OCT, but with resultant decreased motion artifact. Additionally, the 1310 nm light has reduced scattering and therefore better penetration through opaque tissue such as an opaque cornea and sclera. This results in better evaluation of the anterior segment and visualization of the angle and to a lesser degree, the ciliary body. There are 2 modes to the Visante OCT: standard resolution imaging and high resolution imaging. Standard resolution imaging provides a broader view of the anterior segment with a 16 mm width and 6 mm depth image. This provides a full overview of the anterior segment including cornea, anterior chamber, iris and both angles. The high resolution imaging mode (High Res Mode) provides a more detailed image with dimensions of 10 mm width with 3 mm depth. The High Res Mode is more appropriate for imaging of the cornea and any segment in need of detailed evaluation. In the standard resolution mode the Visante performs 256 scans assessing the 16 mm by 6 mm area in 0.125 seconds. In the High Res Mode, the Visante performs 512 scans to assess the 10 mm by 3 mm area in 0.250 seconds. The resolution of the Visante images is limited by the spacing between the scans performed. The resolution of the Visante reaches 18 microns axially and 60 microns transversally. In addition to a single scan, the operator has the option of selecting automatic dual or quad scans. The dual scan mode performs two scans, one at a selected orientation between 20 - 200 degrees and the second scan between 160 - 340 degrees. The quad scan mode performs four scans between the 0 - 180, 45 - 225, 90 - 270 and 135 - 315 degree axes. All scans in all modes can be rotated manually to any of the 180 axis lines at the discretion of the operator performing the imaging. The Pachymetric Corneal Mapping (Pachy Map) module in the standard software performs 8 modified high resolution scans of the cornea in preset radial axis lines starting at 0 degree axis and rising at 22.5 degree intervals. The High Res Mode allows for the Pachy Map to be performed in 0.5 seconds with little artifactual distortions. The Pachy Map produces a 10 mm by 10 mm pachymetric map of the cornea, revealing the corneal thickness in all locations. The preset grid separates the cornea into the central 0 – 2 mm area along with eight radial regions at 2 – 5 mm, 5 – 7 mm, and 7 – 10 mm concentric to the central region. All areas produce 3 numbers, the thinnest area, noted as the top number, the average, noted as the middle number, and the thickest area, noted as the bottom number. The Global Pachy Map in the Visante 2.0 software performs 16 modified high resolution scans of the cornea in 1.0 second. The preset radial axis lines start at the 0 degrees and rise at 11.25 degree intervals. The Global Pachy Map is able to provide twice as many data points and therefore a more detailed evaluation. The repeatability of the Visante pachy map in the standard mode was noted at 7 micron standard deviation in the center and 14 micron standard deviation in the periphery. The Visante is also equipped with an optometer capable of changing focus from a +20 diopters to a -35 diopters. 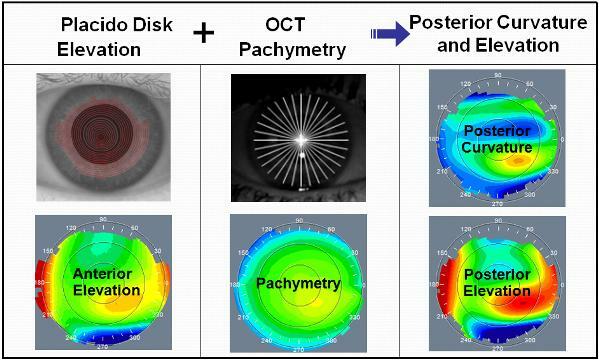 As the optometer changes focus, accommodation can be induced and as such dynamic changes of the anterior segment can be quantitatively measured. In the Visante 2.0 software, there is an additional Enhanced Mode for the Anterior Segment Mode scan and the High Res Mode scan. In the Enhanced mode, four consecutive scans are performed and compressed into a single image to produce a higher density, higher contrast image. Additionally, new software tools to produce a phakic IOL template and measurement tools for endothelial clearance and lens vault distance, along with more sophisticated angle measurement tools are among the many enrichments that have been devised. Visante Anterior Segment OCT images can be used in evaluation of the refractive patient, both pre-operatively and post-operatively. 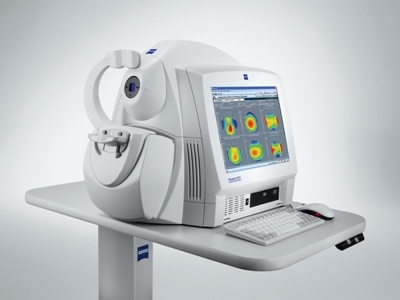 It is capable of providing broad overview images of the anterior segment and more detailed high resolutions of specific areas. Pachymetric mapping, angle evaluations, corneal flap evaluations, and phakic IOL templates are some of the useful features that will be demonstrated in examples in the remainder of this chapter. The ATLAS Corneal Topographer (Carl Zeiss Meditec, Dublin, CA, USA) is a non-contact placido disc based system that creates anterior surface computerized topographic information. The latest 3 models, the 993, 995, and the 9000 are capable of linking data with the Visante 3.0 Software. The ATLAS 9000, which is the latest version, is a 22 ring placido disc system (18 superiorly and 22 inferiorly) that uses non-visible 950 nm infrared light. The information obtained is from the reflection of the rings from the corneal surface. Therefore, the data obtained as such pertains only to the anterior corneal surface. The Visante 3.0 version is upgraded with a tracking device so that once the corneal pachymetric mapping is commenced the device will keep the sequential scans centered to the same location. Additionally, the vertex of the cornea is recognized as the point with greatest signal in a vertical scan. The vertex of the ATLAS scans and the Visante pachymetric scans are matched to represent the same location. By using the corneal thickness map (pachymetric data), with known anterior surface curvature data from the ATLAS, the posterior corneal curvature data may be calculated. Amin Ashrafzadeh, MD, is a highly experienced ophthalmologist specializing in LASIK and cataract surgery. Over the course of his career, Dr. Ash has helped numerous LASIK and cataracts Stockton / Modesto patients realize their dreams of clear vision. In addition, Dr. Ash frequently treats patients from Manteca, Tracy and Merced.